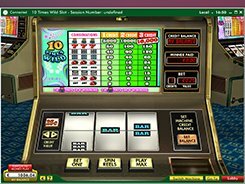 10 Times Wild is one of those rare video slots that are designed with a single payline. The game looks much like a mechanic one-armed bandit having a lever on the right side of the machine and 3D controls below the reels. 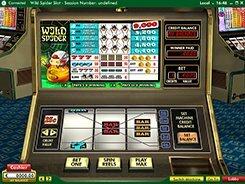 The gaming action takes place on a single screen, with the combination paytable displayed right above the spinning reels. By clicking the “+” and “-“ buttons, a player may increase or reduce a coin value in a range between $0.05 and $2 and place a maximum of three coins per line, per spin. The symbols are of a classic set and include cherries, BAR variants, sevens and a slot’s logo. The 10 Times Wild logo helps complete winning combos by substituting missing symbols. One wild symbol used in a combo will multiply the winning amount by 10, whereas two wilds that substitute in a combination will multiply the winning by 100. The slot features a huge fixed jackpot worth 16,000 coins; this is awarded for hitting three logos on the payline when betting three coins. So making a 6-dollar bet per spin, you may scoop a breathtaking $96,000 prize. PLAY FOR REAL MONEY!